This article is about the town Narathiwat. For other uses, see Narathiwat (disambiguation). 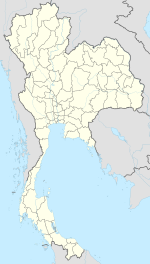 Narathiwat (Thai: นราธิวาส, pronounced [nā.rāː.tʰí.wâːt]) is a town (Thesaban mueang) in southern Thailand and capital of the Narathiwat Province. The town is located within the Mueang Narathiwat District and was established in 1936. As of 2008, the population was 40,521. It lies 1,141 km south of Bangkok. Narathiwat is on the east coast of the Malay Peninsula, by the Gulf of Thailand. The Bang Nara River flows through the town. The immediate vicinity of the town is flat or gently rolling, but there are hills both to the west and south. Narathiwat has a tropical monsoon climate (Köppen climate classification Am). Since Narathiwat is very close to the equator, there is little change in temperature during the year. Rainfall is abundant throughout the year, but there is a drier season from February to April, and rainfall is particularly heavy in November and December. Route 42, to the north, connects the town to Pattani and then to the Phetkasem Road (Route 4), which connects to Bangkok. Routes 4055 and 4056 lead south-west, in succession, to the Malaysia-Thailand Border at Su-ngai Kolok, while Route 4084 leads south to Tak Bai and then east via Route 4057 to Su-ngai Kolok. The town is served by Narathiwat Airport, 13 kilometres (8.1 mi) to the north. ^ a b "Population statistics 2008". Department of Provincial Administration. Archived from the original on 2010-01-21. ^ พระราชกฤษฎีกาจัดตั้งเทศบาลเมืองนราธิวาส จังหวัดนราธิวาส พุทธศักราช ๒๔๗๙ (PDF). Royal Gazette (in Thai). 53 (0 ก): 824–827. 1936-11-29. ^ "Climatological Data for the Period 1981–2010". Thai Meteorological Department. p. 26. Retrieved 8 August 2016. ^ "ปริมาณการใช้น้ำของพืชอ้างอิงโดยวิธีของ Penman Monteith (Reference Crop Evapotranspiration by Penman Monteith)" (PDF) (in Thai). Office of Water Management and Hydrology, Royal Irrigation Department. p. 128. Retrieved 8 August 2016. This page was last edited on 18 May 2018, at 14:19 (UTC).